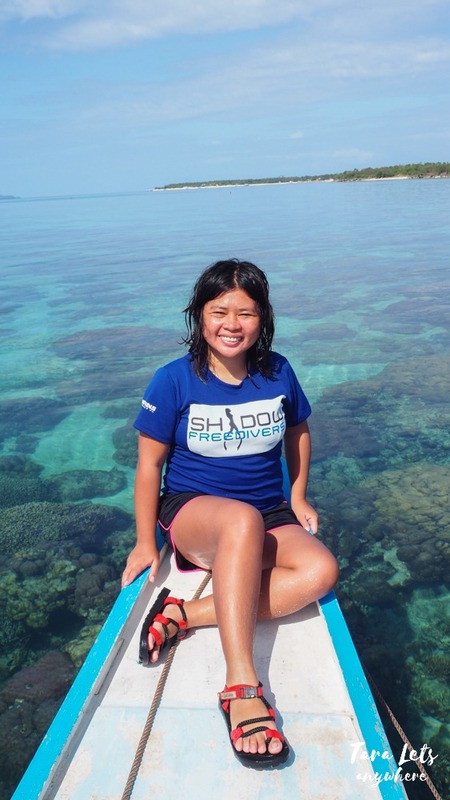 After our freediving lesson in Batangas, our friend Peng invited me for a weekend trip to Maniwaya Island, Marinduque. I wanted to practice threading and snorkeling without a vest, so I said yes. And here’s the deets about this trip! Our group met up in Alabang and we left at midnight. We arrived in Maniwaya Island at about 8AM the next day. There are a few resorts in Maniwaya Island, and we chose to stay in Wawie’s Beach Resort. It’s the default choice for backpackers. What I can say about the resort is that it’s okay, but needs improvement. 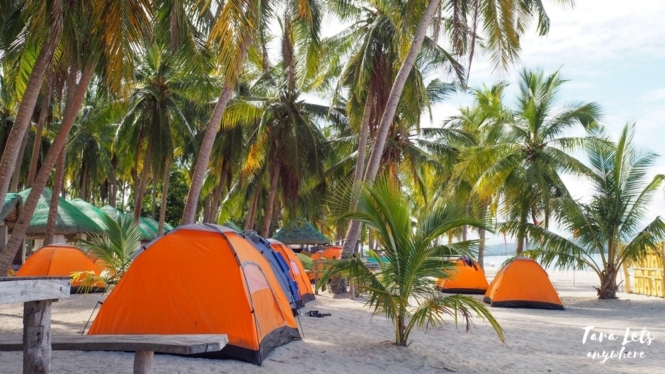 The space for camping tents is huge and it’s easy to choose a spot facing the beach. There are outdoor cottages where guests eat and hang out and there’s a kitchen area that’s available for everyone. The staff here is very helpful and friendly, and you can approach them anytime. Outdoor cottages for day trips and overnight. What I don’t like about it is the state of the restrooms. I’d been backpacking for a while now, and I’m at this age where I want a decent restroom. It doesn’t have to be super luxurious and even the good ol’ pail system will do, but at least I want it functional and clean. Here there’s no trash can or pail in every toilet, although there’s constant running water. Most cubicles don’t have locks, and some don’t close properly. When I first went in the restroom, I walked in on someone in the toilet and when I washed up, it was in a shower stall that is half opened. You can probably tell from my tone how disappointed I was with this. My impression about Maniwaya Island is that it’s a good place for out-of-town trips for barkadas. There’s Wawie’s Beach Restaurant for easy meals and another one nearby. You can bring your own food for cooking and ask for any cooking item you might’ve forgotten to bring from the resort. 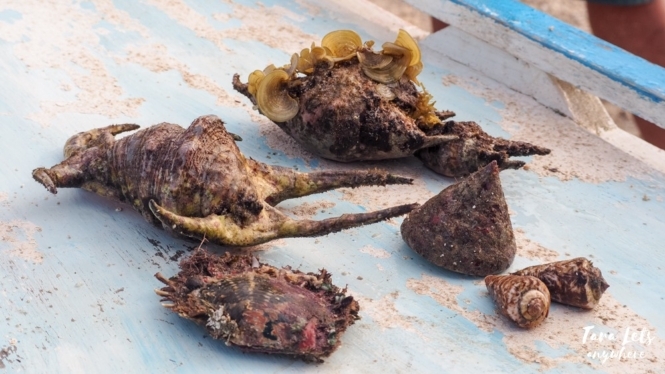 Moreover, you can buy fresh fish and other seafood, depending on the catch for the day. You can spend all day just chilling, drinking, napping or exploring the beach. The beach was calm and very clear. We didn’t swim though because the beachfront was full of seaweeds. 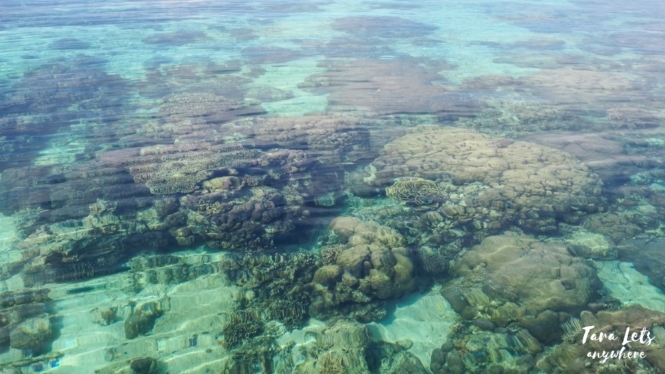 If we had more time, we’d probably try to snorkel past the seaweed field to where we can see the corals and starfishes. 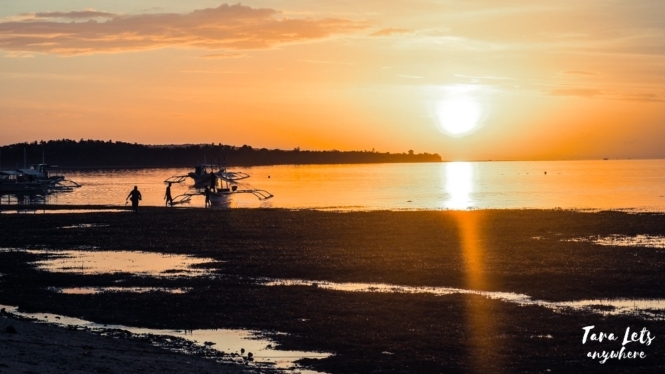 Of course, a beach getaway won’t be complete without island hopping! 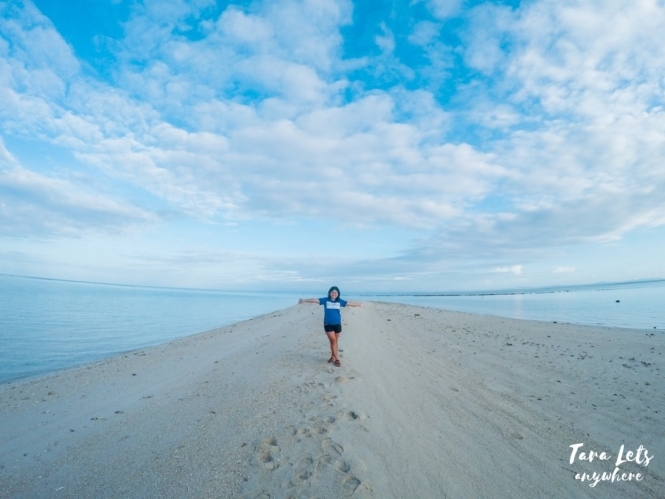 We had three stops for island hopping in Maniwaya Island: Ungab Rock Formation in Mongpong Island, Palad Sand Bar and a snorkeling area. 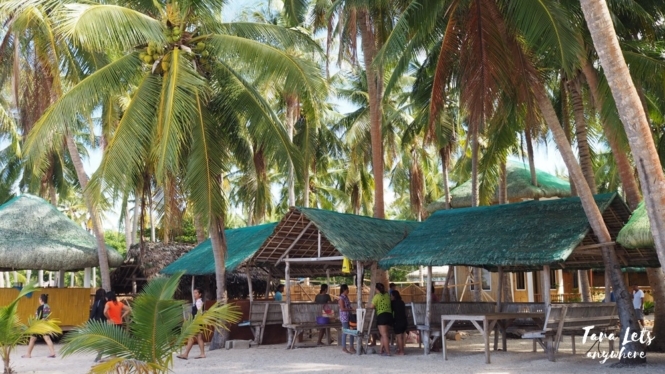 We asked if we could also visit the taclobo (giant clam) sanctuary for snorkeling, but our boatmen said that it had been closed to the public as per DENR. We went to the snorkeling area first. I asked our boatmen the name of the area, but they said it doesn’t have any. It’s probably just a random spot where they take guests who request specifically to snorkel. 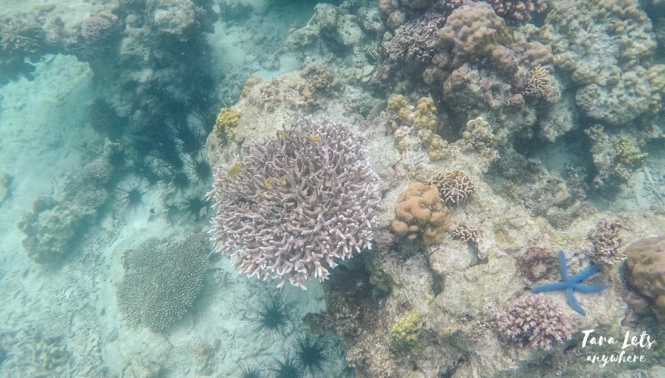 There are lots of corals here, most of them hard corals. There are schools of small and medium-sized fishes, as well as the usual sea urchins waiting to prick unsuspecting victims. I wanted to swim without a vest on as planned, but Peng advised me against it because I didn’t have fins. That was a good foresight because later on the waves got stronger and it would’ve been tiring to swim back to the boat. Next, we went to Ungab Rock Formation. 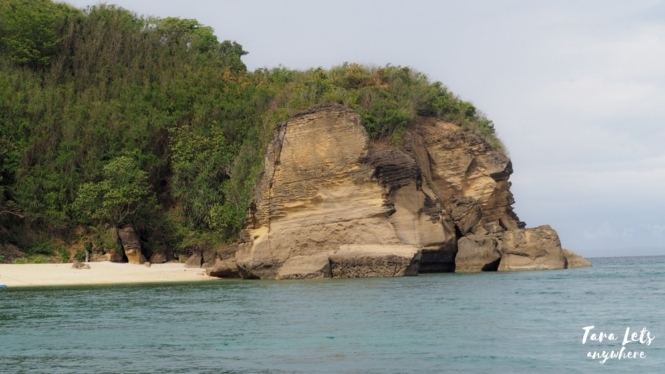 Apparently it’s named as such because it’s located in Sitio Ungab in Mongpong Island. The Ungab Rock Formation is basically an arch, which is a bit fascinating. It looks delicate, as if it would collapse in case of an earthquake. We swam under the arch and took photos. We also explored the beachfront, but it’s full of tall seaweeds that it felt like navigating in an underwater maze. The next morning, we scheduled to visit Palad Sand Bar. The sand bar only appears during low tide. We left our resort just after sunrise and arrived at about 6AM. 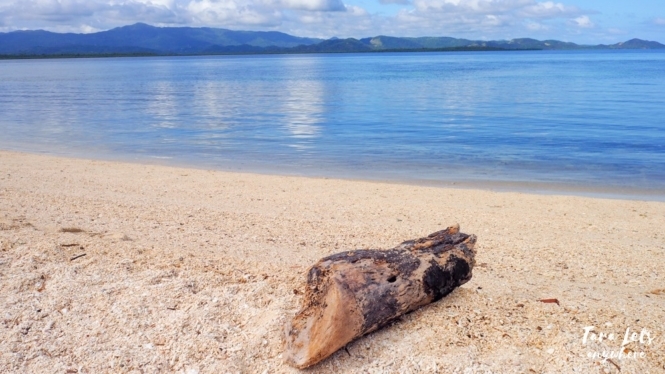 For me, the sand bar looks ordinary — the sand is coarse, grayish. Moreover, due to the low tide, we had to walk very far to be able to swim. Me in Palad Sand Bar. We dawdled here a little while our boatmen look for shells for food. Our boatmen gathered shells for food. We had more free time left so we asked our boatmen to take us back to the snorkeling area. It was still low tide and the morning rendered the water very clear. The corals underneath were highly visible, and it was so beautiful. Normally I’d be nervous snorkeling in low water because I didn’t want to scratch myself or be unable to thread standing up to fix my snorkel, but I’m better experienced now and I took a life vest to be safe. Here are some photos that I took of the coral garden. If this doesn’t entice you, I don’t know what will. Snorkeling area during low tide. 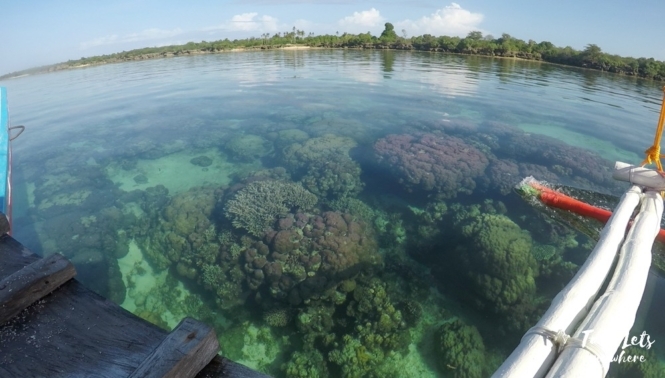 You don’t need to wear goggles and swim underneath to see the thriving coral life. Midway through, some people in our tour group started stepping on corals, insisting that they were just rocks. I asked them not to do that and explained that those were hard corals, but no one listened or took me seriously. 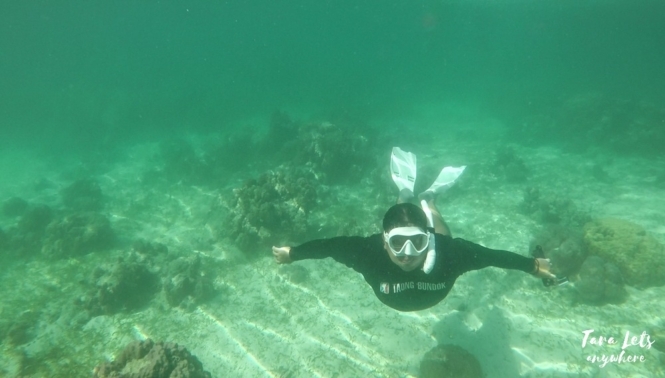 I was agitated seeing them harming the corals repeatedly that I didn’t enjoy snorkeling as much as I would’ve. I’d relayed this story to Hali afterwards, and he urged me to post photos or videos online. However, I’m not really a fan of public shaming because the line between it and bullying is very thin. This incident is not only a matter of discipline, but more importantly a reflection of a bigger problem — lack of local regulations and training. 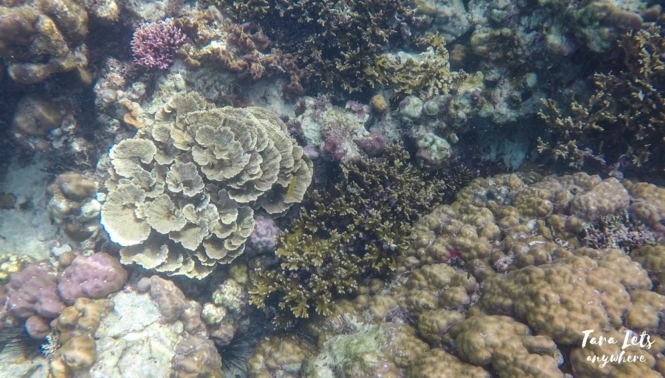 I don’t know if there’s any law prohibiting tourists to touch or step on corals in that area (I hope there is), but I hoped our boatmen at least said something. Anyway, that’s our island hopping experience in Maniwaya Island. While the beaches for me are ordinary, I love the snorkeling area and this this alone made the trip worth it. In general, there are better weekend destinations for people like us who are coming from Manila, but Maniwaya Island has its positive points. It’s easy to commute to, it fits a budget plan and it’s less crowded. It’s ideal for large groups of people, in particular barkadas. 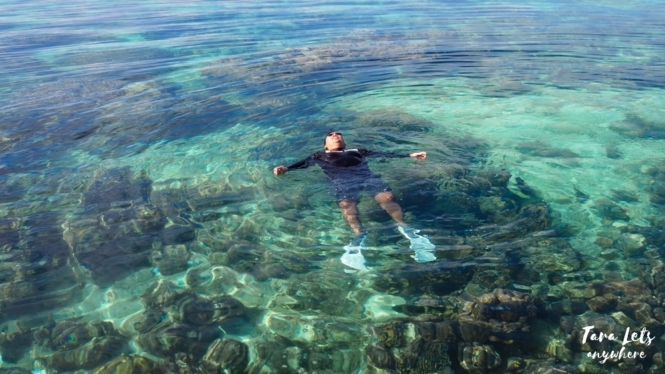 And last but not the least, it offers a good snorkeling experience. From Alabang or Buendia, ride a bus to Lucena and get off at the Grand Terminal (from Alabang: P180, 2-3.5 hours, depending on traffic and how crazy your bus driver is). Then, board a van to General Luna (P170, 2 hours). You will be dropped off to the market where you can have breakfast or buy food supplies. Walk or take a tricycle to the port in General Luna, depending on where your motor boat is waiting. Ask your boat contact to confirm this to you. Boat ride to Maniwaya Island takes 1 hour, depending on sea condition. We stayed in Wawie’s Beach Resort. We brought our own tents and then rented an outdoor cottage where we can eat. Wawie’s Beach Resort also offer rooms. If you’re in a group, I recommend just booking a room because the rates are reasonable and it’s easier than carrying your own tent. 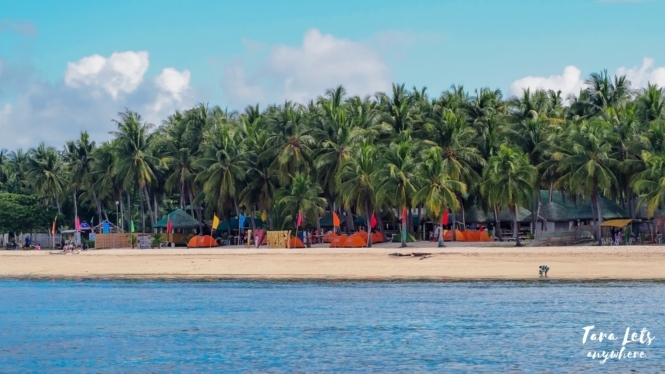 We asked Wawie’s Beach Resort to arrange the boat for us for P6500. However, we learned that if we contact the boatmen directly, we can get it at P5000 only. P.S. Thank you Peng for inviting me in this KKB trip! P.S. 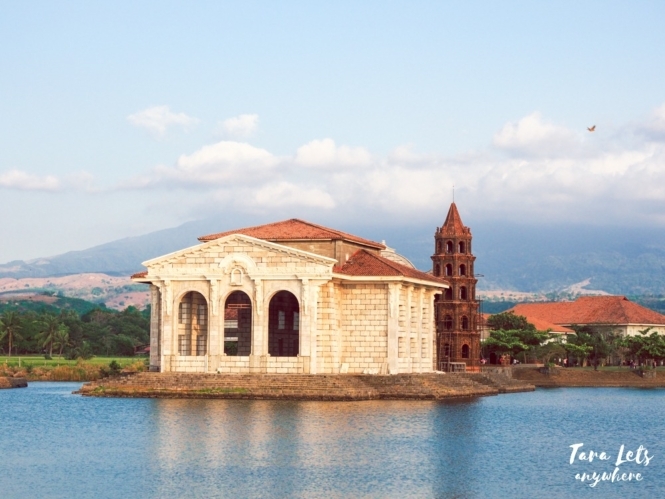 Looking for other weekend destinations near Manila? Have you been to Maniwaya Island? What’s your experience? Hi thanks for the info. I really appreciate it. Were going to maniwaya this May. A friend of mine told me that the easiest and safest way if through dalahican. Do you have any idea? Hi Chat! I’m not familiar with that route but I researched a bit and it says going via Dalahican Port is best if you’re going to explore the mainland first. If you’re going straight to Maniwaya Island, better go via General Luna.